The roofs are the reason conservatories are dubbed virtual saunas when the sun shines. However, most conservatories are unfit to serve their purpose especially with the changing and sometimes harsh weather conditions. As such, homeowners are required to seek alternative solutions such as replacing the polycarbonate and glass conservatory roof systems with solid and tiled options that withstand different elements. But, are the solid and tiled conservatory roof options legal and do they meet the set out conservatory building requirements?. Until 2010, all conservatories in the UK had to have polycarbonate or glass roofs and this explains why most conservatories still have these roofing materials. The solid and tiled conservatory roofing option was approved in 2010 for installation in new conservatories or as replacements in existing conservatories. The solid tiled roof is the guardian warm roof that has total Local Area Building Control approval. These conservatory roofs were approved for use because they proved to be highly sustainable as compared the previous roofing options. In support of this, our guardian warm roofs are offered with a lengthy guarantees. The conservatory must be built at ground level and have a total floor area of less than 30 square metres. The conservatory room should be separated from the main house by external quality walls, windows or doors. The room’s heating system must be controlled separately using on and off controls. Glazing and all applicable electrical installations must comply with the set out conservatory building regulations and requirements. The guardian roof installation process requires 3 to 5 days depending on the size of your conservatory and it rarely disrupts your daily routine. The existing conservatory roof system should be removed carefully and disposed of in an environmentally friendly manner. Our guardian warm roof installation experts will recommend the ideal disposing method if you opt for a DIY project. Otherwise, we remove and dispose the existing roof for you. Guardian warm roofs are constructed using innovative and patented profiles that are tested to meet high UK building standards. Considering a total conservatory roof system replacement is not an easy decision since it requires a substantial financial amount. However, opting for solid guardian warm roof systems pays off in the long run especially among homeowners planning to sell their property. 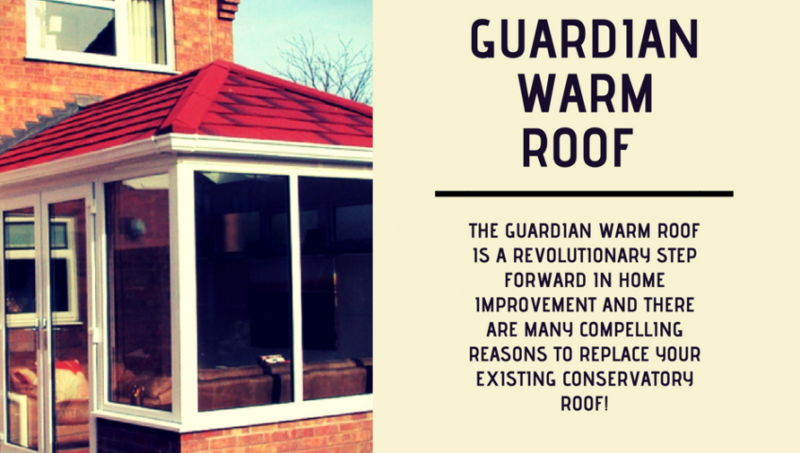 The roof upgrade increases a home’s value by far more than the cost incurred to purchase and install the guardian warm roof system. Moreover, it makes a huge difference to the conservatory room and allows you to enjoy its comfort especially during summer months.